AUSTIN—Today, Lt. 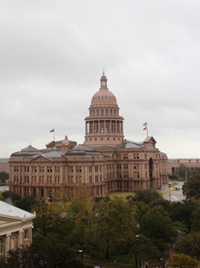 Governor David Dewhurst announced the appointments of several major Senate Committee Chairs. "After spending the last few weeks meeting with almost every member of the Texas Senate about issues facing our state, it is clearly going to be a challenging Session. We need to continue to balance the budget without raising taxes, fight intrusive federal health care changes and dramatic increases in Medicaid costs and pass key conservative reforms – which is why we need proven leadership in these areas," Lt. Governor Dewhurst said. Lt. Governor Dewhurst announced that Senator Tommy Williams (R-The Woodlands) has been appointed Chair of the Senate Committee on Finance. "Senator Williams is a strong conservative who has ably served on Senate Finance and led on major issues facing Texas," Lt. Governor Dewhurst said. "I'm confident in his ability to prioritize state spending and continue balancing a transparent state budget without raising taxes. I look forward to working closely with him this Session to ensure that Texas government lives within its means." Senator Williams replaces Senator Steve Ogden (R-Bryan) as Chairman of the Senate Finance Committee and will chair the upcoming Senate Finance hearing on August 29, 2012. Lt. Governor Dewhurst also reappointed Senator Robert Duncan (R-Lubbock) as Chair of the Senate Committee on State Affairs. "While he is knowledgeable about the budget and school finance, Senator Duncan chairs the important Senate Committee on State Affairs and has helped pass critical issues such as Voter ID and tort reform," Lt. Governor Dewhurst said. "He is a problem-solver whom I have relied on time and time again on a variety of complex issues, and I will continue to depend on his leadership and judgment this Session." Lt. Governor Dewhurst also announced the reappointment of Senator Jane Nelson (R-Flower Mound) as Chair of the Senate Committee on Health and Human Services. "Equally knowledgeable about the state budget, Senator Nelson is the most qualified member of the Texas Senate to lead the Health and Human Services Committee," Lt. Governor Dewhurst said. "As we work together to rein in health care costs and fight the implementation of Obamacare in Texas, I am eager to work side-by-side with Senator Nelson again this Session." Lt. Governor Dewhurst will complete the reorganization of the Senate committees in the near future.